For years, black and red henna were the standard for henna art. However, in recent years, we see a new trend that is emerging in the form of white and flash henna tattoos. What is the advantage of white/flash henna? For starters, it is much better option for people with dark skin tones, and for western culture women that would love a change from the classic oriental and traditional henna tattoo. And the best part about henna tattoo is that it is temporary. After a while, the tattoo will be gone, meaning you can get a tattoo for a special occasion, without worrying it will stay there for 10 days to two weeks like real henna. In the past few years there have been advancement in technique of using white and flash henna. With so many styles and techniques, it is only appropriate we offer them all. Decorate your body with some henna art, and you’ll be sure to attract attention everywhere you go. 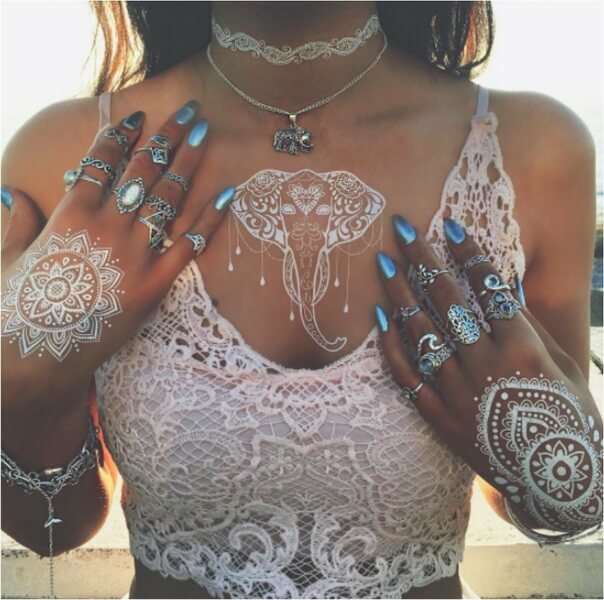 White and flash henna is becoming increasingly better option than jewelry, because of the beautiful and delicate designs, and because you can never get tired of it. No matter if you are wearing bikini, cocktail dress, short skirt, wedding dress, or some classic jeans and shirt, your henna tattoo will look amazing. White henna and flash henna are applied from an artist that specializes in placement and design of body art. Sometimes it is drawn freehand. We come out with everything we need to get the job done. We just need a small table and at least two chairs. There’s no electricity needed and no mess at all. Our prices are standard in the party and event industry. Contact us for a quote. It takes literally 2-3 minutes to apply a flash and about 5-10 minutes for the white henna. We can do both flash and white. Weekend parties book up. As soon as you know your date and location just let us know so we can at least pencil you in.